Root Canal Treatment is a step by step process in which each and every step plays an important role in the final outcome of the treatment, one of the most important step is the determination of Working Length. Working length helps in deciding to what extent the BMP has to be performed and where the obturation should end. Definition of Working Length: The distance between coronal reference point to the point at which the canal preparation and Obturation must End. 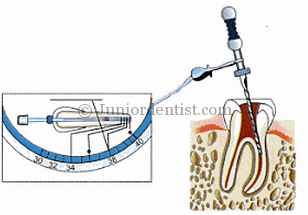 Working length determination is the second step in Root canal Treatment procedure after Access Cavity preparation. It is very important because the objective of Root Canal Treatment cannot be achieved with the working length being determined. After a very long debate about Where the Root Canal preparation should end, it has been decided that it should end at the apical constriction which is the narrowest part. It is described as the point just before the Dentin Ends and the first layer of Cementum begins. If you fail to determine the Working Length, it leads to Failures in Root canal Treatment, such as obturation short of working length, Obturation beyond the tooth apex etc. Anatomical markings of Root Apex: 1) Tooth Apex – Radiographic apex, 2) Apical Foramen – Major foramen, 3) Apical constrictor – Minor Foramen. The average distance between the three have been measured. The Distance between Apical Foramen and Apical constrictor: It differs depending on the age, in patients between ages 18-25 years it is 0.5mm and in older people aged above 55+ years it is 0.7mm. There are 7 methods commonly used in determining the working Length of a Root canal during Root canal Treatment Procedure. In most cases only some of the below mentioned are used, while in some cases a combination of the methods have to be used to get a precise working length. It was given by Grossman in 1970, 7th Edition, mentioned a formula determining the correct length of the tooth. Terms used: CLT = correct length of the tooth, KLI= known length of the instrument in the tooth, ALT= apparent length of the tooth on the radiography and ALI= apparent length of the instrument on the radiography. Step 2: The measurement is transferred to a diagnostic instrument prepared with a silicone stop (K File), this instrument is placed in the root canal and a radiograph is taken. Step 3: The Working lengths are determined with the help of radiography. This is a bit complicated but the most useful method of determining the working length along with Grossman’s method. Step 1: Take a Pre-operative radiograph and measure the length of the tooth. Step 2: Subtract 1.00mm from the measured length for “safety allowance” (this is done to eliminate any distortion of the X-ray. Step 3: Now using the endodontic ruler or Endo Scale mark the File at the tentative working length with the help of the rubber stopper. Step 4: Now place the File inside the canal till the Stopper reaches the anatomical reference point which you should determine for the whole of BMP and Obturation. Step 5: Take an X-ray with the instrument in the canal and measure the distance between the tip of the instrument and the end of the root, now add this amount to the original measures length which was taken in step 2. Step 6: Once you get the measurement, subtract 1.00mm from it to confirm the apical termination of the root canal at the apical constriction. Step 7: Now set the instrument using the stop to the new measurement and start the BMP. 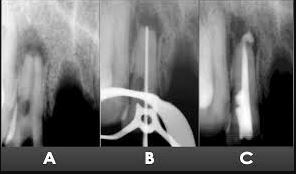 This is just a modification to the other methods of Working length determination techniques, in cases with peri-apical pathology leading to root resorption and resorption of root end or bone shortening. The appearance is seen using Radiographic determination. It is an imaging system which uses uniformly charged x-ray sensitive selenium alloy photo receptor plate in light-proof cassette. An electrostatic image is produced on the photo receptor plate based on the dissipated according to the density of the tissue. The visible image is transferred to a base sheet which can be viewed under reflected light or a trans-illuminated light. It comes with higher quality edges with sharper contrast giving better determination of the borders. Very low Radiation exposure as compared to regular intra oral film. Can be used precisely to capture areas less than 2cm as larger images tend to show higher artifacts. This is the most useful and fastest growing method of Radiography in Dentistry, it is shortly and more commonly known as “RVG” where a sensor is connected to your Laptop or Computer and when exposed produces and stores an image in your device to be evaluated on a Display. It gives better quality images at a fraction of the Radiation exposure (75% less than conventional X-rays). You can even print the images on a paper or just view it in your Display, the software provided come with the options to magnify and even measure the images. Here you can use the measuring scale built-in to the software to measure the approximate length of the root. Multiple radio graphs can be taken without much exposure and less work. It is some thing which is not recommended as can be misleading in most cases, the root canal anatomy is not regular and there are innumerable variations seen such as curved canals, accessory canals, calcification etc. In this method the clinician uses a File to guide through the canal and feel the apical foramen using just tactile sense. It is later confirmed using a Radiograph or Apex Locator. It uses the principal of Apical Constriction which means, the canal constricts considerably as you reach the Apical 2-3 mm of the canal. It should always be used with the help of Radiographic confirmation and not on its own. It is a rather simple technique to determine the WL, it is based on the persons response to pain when the file reaches the Periodontal ligament beyond the Apex. It is useful in chronic non-responsive dead teeth with not sensory nerve supply in the Pulp chamber. Paper points have been used to dry canals before obturation, but you can even measure the apex of the tooth. This is useful in cases with Wide Open apex where the Apex Locator can give false readings. You have to insert the Paper point into the canal until you reach resistance and take out the Paper point to see the tip of the point, if the tip is bloody it means it has extended beyond the apex. It has its limitations, if there is bleeding in the canal, you can get false readings. In case the pulp tissue is not completely removed, if paper point is left for prolonged period of time it absorbs the blood. This is the most advanced and fastest growing method of measuring Working length without the use of Radiography. It has become a must have device in Endodontic practice. The Apex Locator s the name suggests detects the apical foramen, Cemento-dentinal junction or the apical constriction. There have been three Generations of Apex Locators which are using different means of measurements and the latest uses Frequency which determines the Apex with 80-97% accuracy which greatly reduces the need for multiple X-rays for WL determination. It helps in reducing Radiation exposure in Pregnant women. These are almost all the methods which have been used from the start of Root canal therapy till today to determine the Working Length and no one method is perfect. These methods should be used in combinations to get the precise Working Length measurement.